Best All in One Laser Printer for Small Business: Which One to Buy? » Best All in One Laser Printer for Small Business: Which One to Buy? Every business, regardless of its size, require its own set of office equipment for everyday operations. One of the essentials is a reliable printer. If you are trying to find the best all in one laser printer for small business, then this article is perfect for you. Below, you will find some of the most sought-after multipurpose laser printers on the market today. We are going to share with you a detailed review of each one to help you decide which make and model suits your needs the most. Are you ready to find out? Thanks to modern technology, we now enjoy office equipment that can do more than just one task. Take, for instance, a printer. Nowadays, most printers can do a lot more than just printing in that it can also scan, copy, fax, and more. These inventions not only save us lots of money but also free up office space and help us accomplish our tasks easily and in less time. In that sense, it comes as no surprise that you would also want to invest in a multipurpose laser printer for your small business. 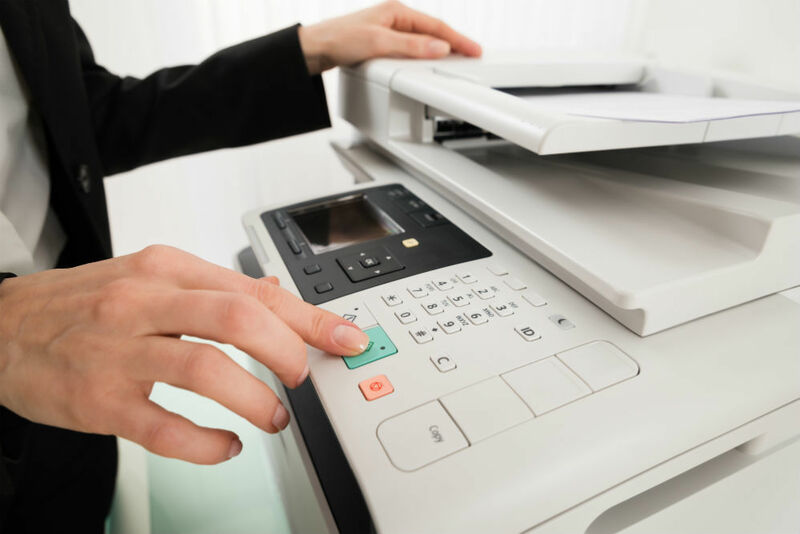 Here are the top five contenders for the best all in one laser printer for small business. The first on our list is the Canon Lasers imageCLASS MF414dw printer. This remarkable machine comes with some really impressive features that will leave you not just satisfied but in awe. This all-in-one printer can do anything from copying to scanning, faxing, and dual-sided printing. It also comes with a password-secure department ID that can record up to 300 user IDs. What makes this a great addition to any office is its wireless and mobile connectivity feature. Its high paper capacity, which can hold up to 800 sheets, is another feature that makes it perfect for small businesses. This means that you can rely on it to print many documents without having to keep inserting sheets over and over again. Whether you need to print text documents or vibrant photographs, this professional-grade printer has got you covered. It boasts a powerful processor that supports a monstrous printing speed, allowing you to print up to 35 pages in a single minute without sacrificing the quality of the output. Next on our list is a printer that is designed and manufactured by Brother, a unanimously well-regarded name in the world of printers and other office equipment. No matter how complex the document or how vibrant the photograph you wish to print is, this printer will provide you with the same quality you see on your computer screen. For any small business, the MFCL8610CDW printer would prove to be helpful due to its ultra-fast speed not only in printing but also in copying. In fact, in just under a minute, this little beast can print or copy as many as 33 sheets. It also boasts a pretty high paper capacity that can hold up to 1050 pages. The MFCL8610CDW is also designed with multiple trays for papers of different sizes such as letter and legal documents. It even has a special tray for envelopes too! Surely, you can rely on this printer to take on many office assignments. Last but not the least, once you activate the machine, the Amazon’s DR service also monitors this printer’s toner level. As soon as it detects low levels, this feature automatically re-orders one for you, making sure that you always have a backup. Anyone looking for the best all in one laser printer for small business should always consider at least one HP printer. For this list, we have the HP LaserJet Pro M277dw. This machine is perfect for businesses with limited office space yet require an all-encompassing, professional-grade printer. Despite its small size, the HP LaserJet Pro M277dw can do more than just print but also copy, scan, and fax. It can be used to create highly professional-looking documents, brochures, and much more. Even better, you can do all that in a very short amount of time. With a limit of up to five users, this machine can print 19 pages in a single minute, which is a good number considering its compact size. Aside from its speed and performance, this machine also boasts versatility as it allows you to print documents from your PC, tablet, laptop, or even your mobile phone. It allows for wireless connectivity too! Similar to the previously reviewed articles, the HP LaserJet Pro M277dw is also designed with special security features that keep the privacy of your documents intact. Using HP’s own cartridges also increases this machine’s printing output. A one-year limited warranty to safeguard your investment also comes with every purchase of this remarkable printer. Yet another contender from Brother is the MFC-L5900DW printer, which is a bit different from the others as it only prints in black and white. So, for people looking to print fancy, colorful leaflets, this machine is certainly not for you. Nevertheless, it still comes with enough features that make it a favorite among small business owners. It is equipped with both Ethernet and Wi-Fi connectivity, which would enable you to print right from your mobile. Alternatively, you use the colored touch display, with its various customized shortcuts, to scroll through the menu. Moreover, this printer is also known to deliver crisp and clear prints at high speeds. In fact, it can deliver an output of up to 42 sheets per minute. It is also designed with security features to keep your documents safe. Another notable feature that this printer has is its advanced scanning capability. It is intelligently designed to support different scan-to-destination options such as SharePoint, USB, email, Network, Cloud Services, and more. This feature makes it a perfect addition to any small business. Although the Lexmark CX317dn is a printer designed for home-use, its professional-grade features make it one of the best choices for small-scale business. For one, it accommodates up to five users and handles printing, copying, and scanning tasks. With this printer, you can bid farewell to those ugly and messy wires and cables as it allows for both wireless and mobile printing. Despite the absence of wires, though, it can still deliver extraordinary prints. It can be used to create black and colored documents, clip arts, photographs, and more without tarnishing their resolution. The speed with which it prints and copies documents also deserves applause. In a single minute, this machine can finish as many as 25 sheets. On the other hand, its double-sided printing feature can print 12 sides in the same amount of time. The real hero, however, is its scanning speed, which can do over 30 sides per minute. So, what are the things that make a printer good enough for a small business? Is it its durability, printing speed, or printing quality? Could its affordability and versatility the answer? Or perhaps a mix of them all? Obviously, a printer that boasts the perfect blend of all these features is the one that deserves its rightful spot in your office. Taking everything into consideration, it is clear to see that the Canon MF414dw is the true epitome of excellence in terms of fulfilling all the requirements of a good all-in-one printer for small businesses. But then again, this does not mean that the rest of the choices are not worth it. Nevertheless, if you want a high-quality printer for long-term business use, then give the Canon MF414dw a shot.